In order to enjoy such a wonderful sport as ice fishing, you must be specific with your choices. 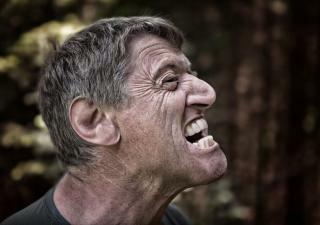 You must be specific in what you do and how you do it as there’s a huge room for mistakes that could spoil everything. But also, you must be exact when it comes to your equipment, and so when it comes to what boots you use. As I know all this first hand due to my years of experience, I’ll try to help you by giving actionable advice I wish I’d had when I first started. So, here’s the list of the best ice fishing boots right now. I tested these boots thoroughly for months following specific criteria to select them, so you don’t have to run around wasting money and time. In terms of protection from the weather, these Lacrosse ice fishing boots came with 2,000 grams of Thinsulate Ultra Insulation that acted as a barrier which kept my feet dry and warm. Also, they came with a Dry-Core waterproof membrane that wouldn’t let any water come inside the boots, something that I think is essential for anyone who likes ice fishing as water is always at sight! Moreover, the boots guaranteed me incredible traction on a very difficult surface such as ice thanks to their Ice Grip outsoles that had a unique lug pattern that would successfully shed show and debris. When talking about comfort, these boots came with removable EVA insoles that cushioned my feet in every step, something that’s always valuable for me as I usually end up having feet and knee pains after being on my feet all day. Also, the boots gave me constant stability and underfoot support thanks to their nylon shanks that balanced the feet when walking on uneven surfaces. In terms of durability, these work boots were pretty durable and flexible thanks to their combination of full-grain leather for endurance and 1000 denier nylon for flexibility. And finally, the boots were able to deal with almost any external factor, something that’s really valuable for those men that want to get the best out of their boots as they came with reinforced heel and toe caps with great abrasion resistance. In terms of protection, these MuckBoots kept my feet safe from the cold temperatures that come with ice fishing as they came with a 2mm thermal foam underlay that isolated the feet from external low temperatures. Also, they came with molded outsoles that provided me great traction to walk comfortably on ice, which is a very sketchy surface, preventing falls and possible injuries. Additionally, the boots came with waterproofing capabilities that gave me the assurance I would do my thing without getting my feet wet. 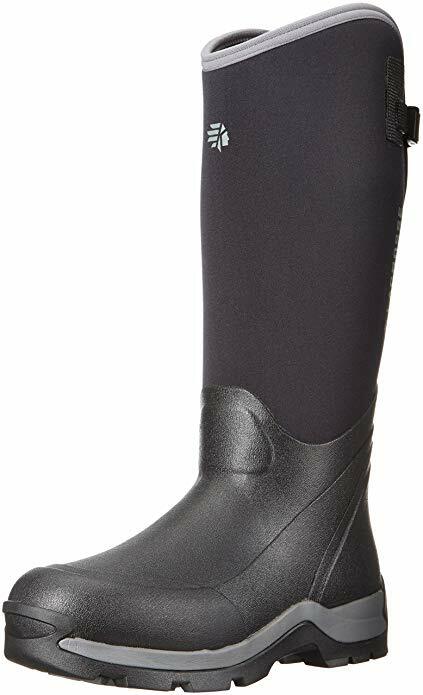 In terms of comfort, these MuckBoots Artic Pro boots came with cushioned EVA midsoles that gave me the shock absorption attributes to comfortably walk on a really hard surface as such as ice. Also, the boots came with double reinforcements at instep, heels, and achilles, which meant that I would be constantly supported in those key areas of my feet. This was something that I really appreciated as walking on ice puts a lot of pressure on the joints. In terms of protection, these Baffin ice fishing boots came with great features that provided, for example, reliable traction when walking on ice, something that’s vital when ice fishing. This was possible thanks to their fully-tractioned outsoles with awesome patterns that provided great traction on ice, a surface that’s really slippery! Moreover, the boots gave me the assurance I would keep my feet dry thanks to their waterproof construction uppers. Additionally, the boots provided extra insulation with a temperature rating of -70C/-94F thanks to their inner foaming, molding, and removable insulation liners. In fact, these Baffin Control Max boots were so good for cold weathers that they even came with a sole made with several advanced thermo-set polymers that guaranteed me a great level of insulation, traction, and comfort. I really loved how well these boots cushioned my feet in every step, which was possible thanks to their EVA midsoles. Additionally, the boots came with multi D-ring laces that gave me the chance to achieve a customized fit which was essential to be comfortable at all times. And finally, in terms of durability, these boots were really tough but comfortable at the same time, given that they came with a full-grain insulated leather that not only protected my feet from the cold but also made the boots really durable. Temperature Rating Of -70C/-94F With A Waterproof Construction. Top Cinch To Keep The Warmth Inside. 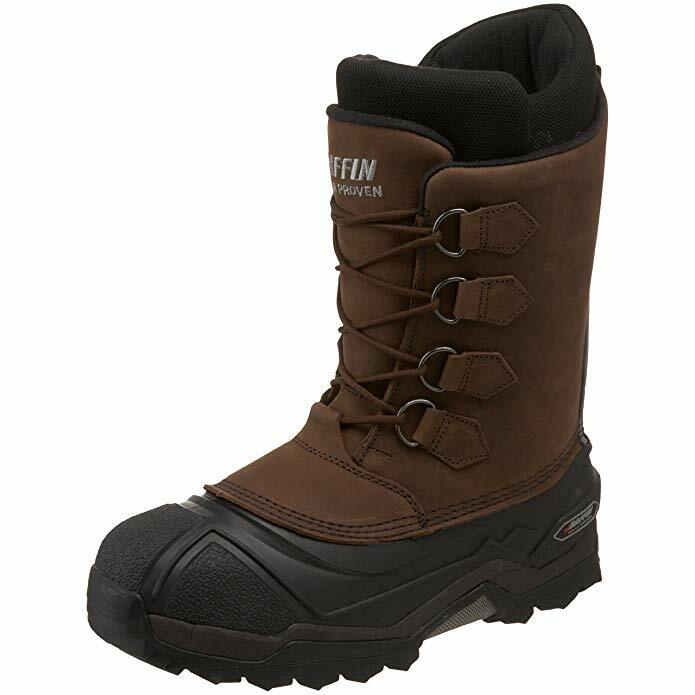 Baffin Combines Leading Molding Technology With A Foam-Based Inner Boot System, Which Equates To More Warmth, Better Fit, And Superior Comfort. The Sole And Midsole Are Molded To The Base In One Continuous Process. The Sole Is Made Up Of Several Advanced Thermo-Set Polymers Combined Together To Achieve The Right Balance Of Warmth, Protection, Low Weight And Grip. In terms of protection, these Lacrosse boots maintained my feet warm and dry thanks to their 7mm of naturally insulating neoprene that while combined with fleece lining acted as a barrier that kept the cold air particles outside the boots. Also, they provided great traction and stability given that they came with an Anke fit design designed to balance the feet and ankles so I could walk confidently on ice. In terms of comfort, the boots cushioned my feet in every step thanks to the shock absorbing features provided by their thick EVA midsoles. Also, I loved the molded kick-off heel plated as it made the removal of the boots much more convenient, which saved me lots of time. And finally, the boots were really easy to roll down to dry them out as they came with signature gussets, an attribute that became really convenient after a long day of ice fishing. This feature would also let me tuck in my pants and would adapt to the size of my calves, a feature that I found to be hugely helpful. To conclude, the boots came built with ZXT rubber that seemed to be not only flexible and comfortable but also very reliable, a feature that gave me the confidence that I had spent my money right. 7Mm Of Naturally Insulating Neoprene Combined With Fleece Lining. Thick Eva Midsole Provides A Comfortable Insulation Underfoot When Standing On Frozen Ground, Snow Or Ice. Signature Gusset Incorporated To Provide Best-In-Class Versatility Which Makes The Boot Easy To Roll Down To Dry It Out While Providing Extra Room To Get In And Out Of The Boot. Also, Opening The Gusset Makes It Easy To Tuck In Pants While Expanding For Larger Calves And Cinching Down For Smaller Ones. Textured Finger Grips And An Angled Top Band To Easily Grab Hold And Pull Them On, Even When Wearing Gloves. Molded Kick-Off Heel Plate Makes For Easy Hands-Free Removal. Built With Proven Zxt Rubber For Durability. Ankle-Fit Design To Keep The Boots On Even In Deep Mud. In terms of protection, these boots maintained my feet dry, warm and away from suffering hard conditions such as frostbite when ice fishing, thanks to their Vapor Barrier insulation with valve. This attribute is basically a thick layer of wool sandwiched between two layers of waterproofing rubber, compressed to make a thin barrier that kept water and cold away while letting air circulate to avoid moisture and feet odors. Additionally, the boots gave me the traction to walk with the guarantee that I wouldn’t ever fall and injure myself while walking on ice, which is a really slippery surface. This was possible thanks to their vulcanized rigid rubber outsoles that would dig deep on the ice without letting the boots slip. In terms of comfort, these ice fishing boots gave me the sweet comfort of adapting to the shape of my feet given the flexibility of their materials and the fact that they came with nylon coated lace eyelets, essential to provide a secure and comfy fit. 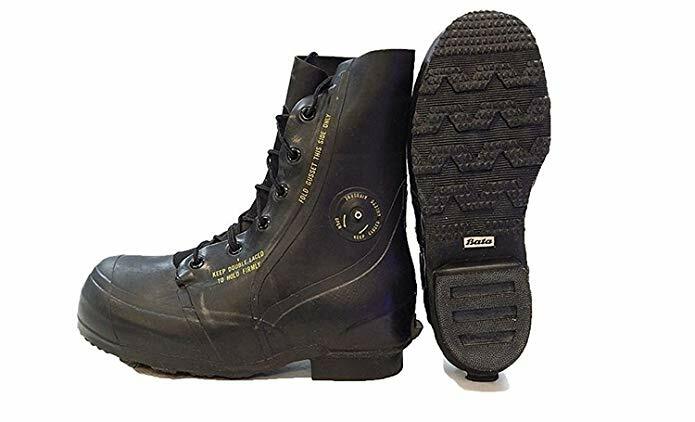 In terms of durability, the boots came manufactured with a genuine U.S. Military Army Issue that in combination with their direct molded sole provided me the confidence that it was going to be more than difficult to break the materials that made these boots apart. Genuine U.S. Military (Army) Issue, Not Commercial Knockoff Or Foreign-Made Imports. Waterproof Rubber W/ Fused Gusset Tongue. Vapor Barrier Insulation W/Valve, Comfortable Use To -20 Deg F! These Boots Offer A Unique Solution To Water Evaporation From The Feet, The Leading Cause Of Frostbite. A Layer Of Thick Wool And Felt Is Sandwiched Between Two Layers Of Waterproof Rubber, And Compressed To Make A Thin, Watertight Insulated Barrier, Unaffected By Outside Moisture Or Sweat Moisture From The Feet, Keeping Your Feet Dry And Comfy. High Blucher Style That Features A Seamless Shell Design. Air Pressure Release Valve, To Be Opened During High-Altitude Flight Or Climbing To Allow Air Pressure Between The Layers To Escape. Gusset Fused To The Main Body Along Its Whole Length. Would you like to know why I chose these MuckBoots Artic Pro boots to be the best ice fishing boots? Then check out their review by clicking the button down below! It says it on the name, it’s ice fishing. It’s not regular fishing. You’ll have to be prepared to go ice fishing on really cold temperatures which means that you’ll have to get boots with proper insulation. This insulation technology will keep the cold particles coming from the exterior of the boots out, leaving your feet warm and dry. Moreover, the more grams of insulation the boots have, the more isolated from the external temperature your feet will be. You should get a hunting boot that has around 200gr of insulation material if you’re exposed to normal winter temperatures ranging from 30°F to 50°F. You should get a hunting boot that has around 400gr to 600gr of insulation material if you are exposed to the previous temperatures BUT don’t have to do a lot of movement. You should get a hunting boot that has around 800gr to 1000gr of insulation material if you’re regularly exposed to extreme cases of low temperatures. There are two big problems with getting insulated ice fishing boots. 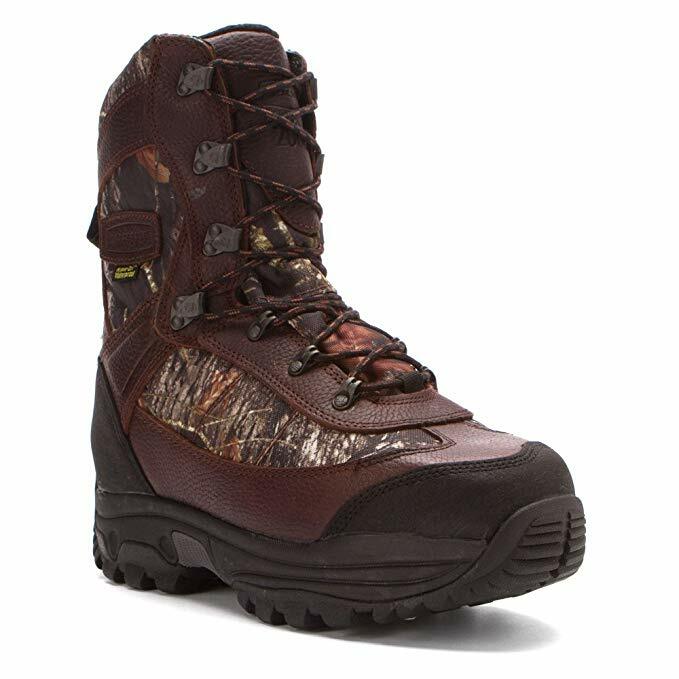 The first one is that with more insulation comes more weight, and, with the more weight the more bulkier the boots get which could totally ruin your hunting experience. Luckily, the best ice fishing boots have the proper amount of insulation made with the latest technology which makes them not only great for the cold but also not that bulky. And the second big problem is that most insulated hunting boots aren’t breathable which brings other problems such as the build-up of moisture and feet-odor. Hopefully, the boots listed in this article use a high-quality type of insulation that lets the air flow and wicks away moisture and these nasty odors. What Insulation Do I Recommend? The type of insulation I always recommend is the one known by the name of ‘Thinsulate’. It is made by 3M, a company that instantly reminds me of quality, and has the latest technology which effectively keeps cold away and doesn’t add to much weight to the boots. While ice fishing, there’s a strong chance that you’ll get in contact with water, right? And, for those moments, I always thank god I wear ice fishing boots with the necessary waterproofing features as they will keep my feet dry and away from any cold-related problems such as frostbite. So, get a pair of ice fishing boots with a reliable waterproof membrane so you can enjoy your time ice fishing. When ice fishing you’re constantly having to walk on ice. And you know, ice is one of the slipperiest and hardest surfaces of them all, so if you don’t have a good traction then you’re facing a hell of a task by walking on this area. So, that’s why getting hunting boots with a reliable outsole with great patterns for traction is one of the first features I always look for in my next pair of ice fishing boots. 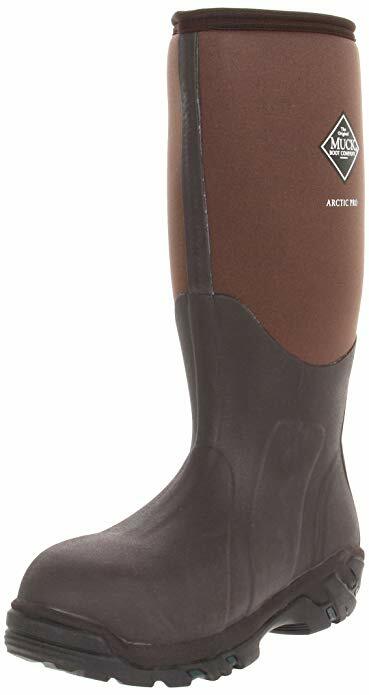 I mean, if you get hunting boots with the right outsoles these will dig deep into the ice on every step giving you the confidence that you won’t slip or fall no matter what! One of the easiest ways to add almost perfect traction when walking on ice is by installing microspikes on your hunting boots. As the name implies, they got spikes that are dug into the hard ice, securing your position and avoiding slips and falls. When ice fishing you tend to be walking, sitting or on your knees on the ice. So, your feet and a great part of your legs are gonna be in contact with the ice almost constantly. That’s why I always look for fairly tall ice fishing boots that provide me a lot of coverage so my feet, heel, ankles, and legs remain dry and warm and my fishing experience is not spoiled. There are two types of ice fishing boots, and which one you prefer is up to you. First, you’ve got rubber boots, which are fairly flexible and keep your feet warm and dry while letting you move freely as they bend pretty easily. And then, you’ve got your sturdy ice fishing boots made with heavier materials designed to handle tougher settings and temperatures. You could get a great pair of ice fishing boots, but they’ll be nothing without a great pair of socks. Getting some nice quality, thick socks should be nice as these will not only make you a lot more comfortable by cushioning your feet, but also will make your feet warmer. So, given this, getting you ice fishing boots with a little bit more size to them so the socks can fit might be a great idea. Most people like to know exactly how the boots perform before they decide to buy a pair. So, for those who are curious, these are the tests I did in order to find the best ice fishing boots. To test whether the boots would keep my feet warm when ice fishing I would pay special attention to what insulation features they had and how these performed. Then, I would compare these performances between boots and would come to a final decision in terms on which boots was good and which wasn’t. To test the traction of these boots I would walk on ice testing if the boots had slip-resistant outsoles that would give me the traction to walk without worrying about slipping and falling. When ice fishing, you’re constantly exposed to getting wet, so I made an effort to test the boots getting them in contact with water to see if they kept my feet dry or not. 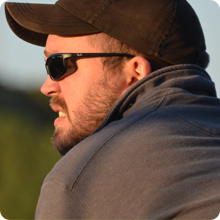 As we all know, insulated boots have a problem with odor and moisture as they don’t let the air circulate easily. So, just to make sure, I would test their breathability features by checking if my feet would end up smelly at the end of the day or too sweaty. There are a lot of benefits related to getting the best ice fishing boots. 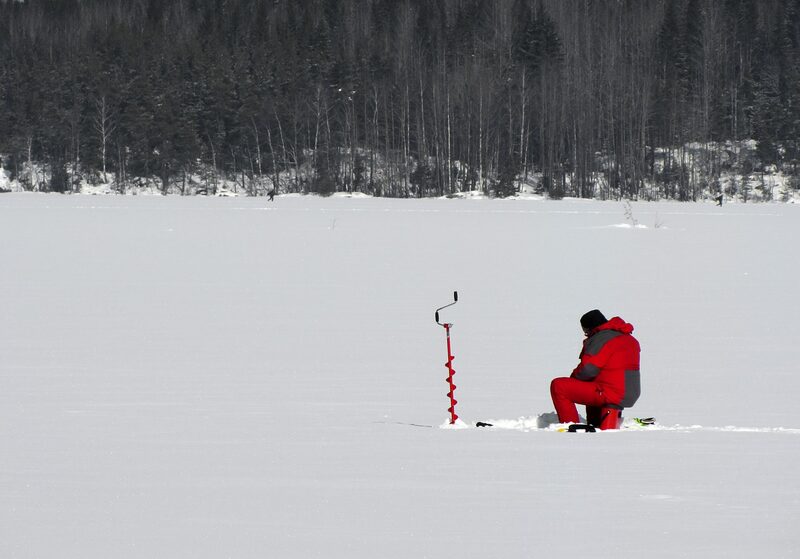 When ice fishing you are constantly in contact with ice and water, so it’s more than usual for people that practice this sport to get their feet cold or wet. Luckily, the best ice fishing boots should have the features necessary to keep your feet dry and warm. Most of the injuries related to ice fishing come from the fact that ice is a really sketchy surface where it’s really hard to walk safely as it’s a more than slippery area. This issue usually ends up in slips, falls and all sorts of injuries. The good news is that with the correct pair of boots for ice fishing, you’ll be able to walk with the confidence that no matter where you decide to walk you’ll be having the best traction. Many ice fishing boots boast a huge number of features as a part of a grand marketing scheme aimed to convince you they have the best option. But the fact of the matter is that it’s not about who has the most features, it’s about what brand provides the best combination of features. Otherwise, you’ll be buying a pair of boots that has dozens of features but ends up being bulky and very uncomfortable. Hopefully, if you get the right pair of ice fishing boots you’ll end up receiving all the necessary features in a package that’s not only comfortable but fairly lightweight. What Socks You Should Use? As I told you previously, you should get ice fishing boots with a little bit of room left to place for you to use a quality pair of socks. In this way, you’ll be complementing the boots’ insulation features and securing a warm and nice experience when ice fishing. But, the problem is that there are a lot of different options. So, in this next part of the article, I’m gonna help you by explaining a little bit more about what socks you could get. 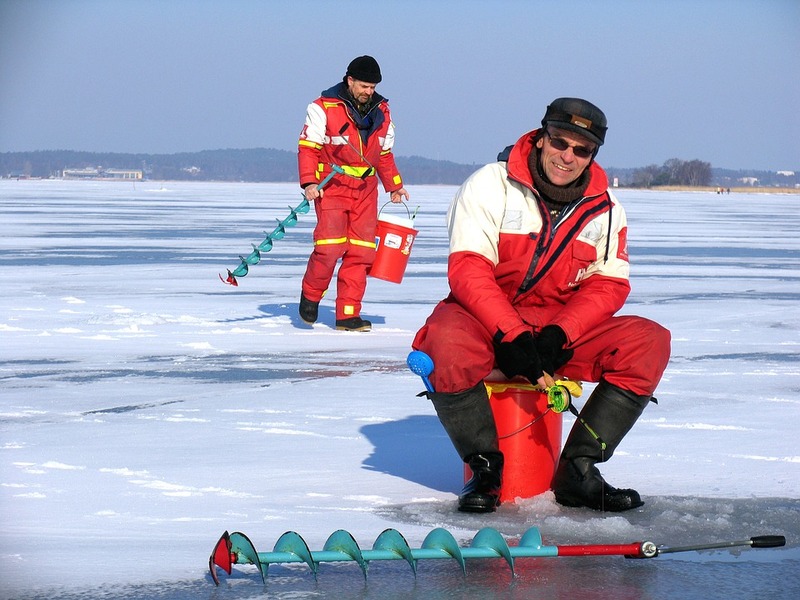 When ice fishing, there’s a big chance that you’ll get into contact with water. 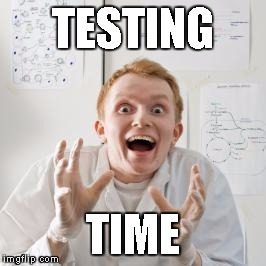 That’s how things are. So, if you wanna avoid having your feet wet in the middle of the fishing trip, then it might be a great idea to get waterproof socks to complement your desired choice of ice fishing boots. These socks are made of fibers tightly sewed together to keep the water particles away from coming into contact with your feet, something that is essential to keep the feet dry. When ice fishing you get to be in some really cold places, right? But, from time to time, these places go from nice cold to extremely cold. For those places, there are the so-called ‘heated socks’. These socks maintain the temperature of your feet on a warm level by keeping the cold particles that come from the exterior, out. They basically work like the insulation material does, and some of them even have some sort of low-amperage to power them through. Besides being warm, when ice fishing, you also prefer being comfortable, right? This is where the fleece socks come in, as they not only maintain the feet warm but also provide them with huge support as they are pretty thick thanks to well, the fleece material, that makes all this possible.